Reports and Dashboards are the most important analytics tools in Salesforce.com. This course will teach you how to use all the report and dashboard features, including advanced features, in both the Classic and Lightning user interfaces. No matter how accurate and complete your data in Salesforce.com may be, you can't assess your business's performance if you don't have solid reports and dashboards. 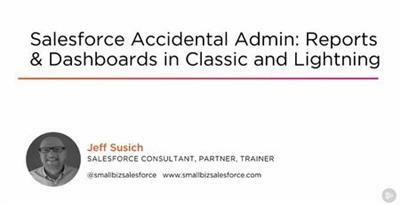 In this course, Salesforce Accidental Admin: Reports & Dashboards in Classic and Lightning, you will learn how to leverage all the report and dashboard functions in both the Classic and Lightning user interfaces. First, you will learn about report builders and the differences between standard and custom report types. Next, you will explore how to create dashboards that put pictures to your business story. Finally, you will discover advanced reporting tools and organization tips. When you're finished with this course, you will have the skills and knowledge to implement and administer a solid reporting and dashboard strategy.